Should You Get Grass Carp For Your Pond? Home > Blog > Aquatic Animals > Should You Get Grass Carp For Your Pond? Grass carp is one of the many types of fish that can be added to a pond. Visually speaking, they are not as attractive as koi or goldfish, and they can also be challenging to acquire. This may leave many pond owners wandering whether it is worth the hassle to get them, but the truth is that there are a number of benefits that this species of fish can provide. Any seasoned natural pond owner will be familiar with both algae and aquatic weed. Algae are a greenish growth resulting from excessive sunlight that if left unchecked will turn your pond into a mini swamp. Aquatic weed is another undesirable plant growth that pond owners will have to control. The grass carp, which has a long, elongated body with a white or grayish color, has been used by the Chinese for thousands of years to control the growth of weeds in their rice paddies, as well as a source of food. Marco Polo mentioned the grass carp during his travel to China and the fish has also been used by the Russians for the same purposes, as a natural way to control weed. The grass carp is distinct from many species of fish in that it is a vegetarian, which means it sees both algae and aquatic weed as being a delicious meal. However, this is only one of the many benefits that grass carp provides. It also grows rapidly, tastes wonderful and is an excellent sports fish. The downside is that grass carp has been outlawed in many places. The grass carp, in addition to being a vegetarian, has other traits which make it distinct from other fish. For instance, it does not muddy water while consuming plant materials, which makes it beneficial for ponds. Rather than consuming plants completely, it tends to “shave” them, which means that it consumes them from the top while leaving the bottom or root intact. Because it does not pull up plants by the root; this means it doesn’t pull up mud, keeping the water clean and clear. Grass carp also don’t eat other fish or their eggs; they prefer plants and weeds. With a sufficient supply of plants grass carp can become quite large, and can weigh up to 20 pounds. However, some have been known to reach weights as high as forty pounds. The grass carp was first brought to the United States during the 1960s. Today it is seen as being an invasive species in many states, largely due to misinformation surrounding it. 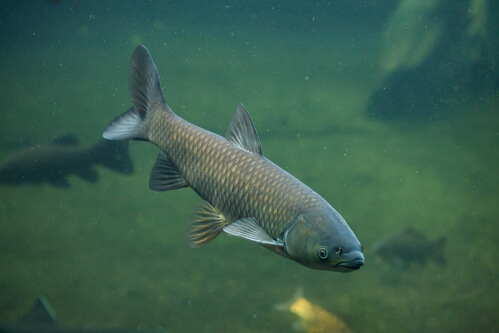 The primary misconception is that grass carp will reproduce excessively and threaten the native ecosystem, which has led dozens of states to prohibit it. In other states, it can be purchased, but a permit is required to do so. To find out if you can acquire grass carp, you should contact the Division of Wildlife in your state to learn more.